Well, it feels like most other days, to be fair. But, yes, things are happening - I have a few sales now on almost all of the currently available distribution channels, and a green light from Smashwords, meaning that the rest should follow in their own sweet time, some quicker than others. I've been quite good at keeping away from the various dashboards and so on - I know I'm not going to be selling hundreds of copies every day, so there's no point in obsessively refreshing the page every few hours. Mainly I need to keep busy with all the other things I should be doing. There's the mystery of how to get Shelfari working properly, for example - it seems to treat the Kindle and paperback versions as two completely separate objects, written by two different people, only one of whom is me. This needs more head-scratching. And reviews. Reviews are the key to this whole enterprise, I'm told. And it's no good soliciting them from people who share my last name or IP address - that's kind of obvious. So, there is much behind-the-scenes work going on to deliver my book to people who will not only read it, but give it an honest review. That takes time, though - you have to let them read it, and then formulate a review. Patience. The word of the day is patience. No going back, I said - apparently without irony. Click here to buy your very own personal copy! Amazon and Kobo are live; a few others are still stuck in the Smashwords pipeline, including the iBookstore. More news as I get it. Giveaway ends July 11, 2013. Well, in my dream life, he does. I need some copies to hawk around, and - I think - to give away as freebies on Goodreads. 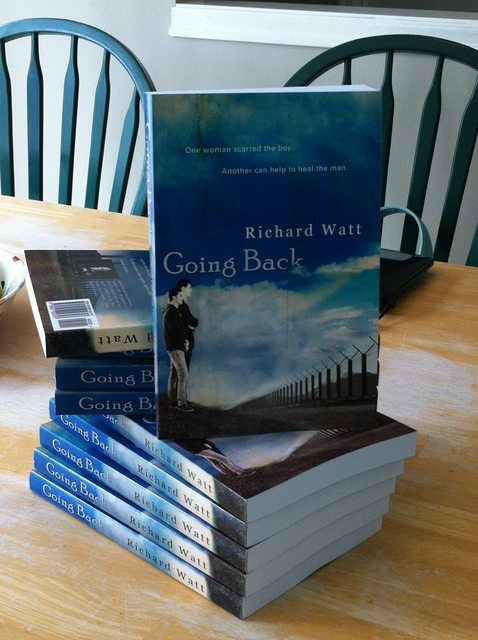 In a little over a week from now, you'll be able to go to your favourite online bookstore and buy a copy of Going Back. There is a part of me which wants to think back to the very beginning of this process; to think about how I got here from there, but honestly, I don't really have time. For example, while I'm updating my online presence in every way I can think of today, I'm also trying to think of ways to improve my press release, and generally coming up with nothing. Now, that may be a good thing; it's possible that it really does say everything I want to say about the book, but I can't shake the nagging feeling that there;s something else I want to put in there. Don't give it away. I am a firm believer that people attach a value to things. If you give it away, however professional and polished it looks, your readers will value it less than if they had to pay for it. I don't mind it being shared or lent (and of course, sold second-hand when that day comes) but I don't think I should be saying "here, have a free copy"; I don't think that's the message I'm trying to get across. Make people want to buy it. I don't really know how that's going to work. I know it's a good book; it looks like a good book; I'm happy with the blurb and the publicity package, but still.... This must be what everyone goes through, I suppose. It's just that, with no experience of doing this, I don't know if it's going to work. I do know that publicising through Facebook has caused many hundreds of complete strangers to click on the 'Like' button, but that's easy - not the same thing as buying a copy at all. Be shameless. At least, be shameless without being egregiously shameless. I post infrequently on a handful of sites around the web. Some of them I feel comfortable blowing my own trumpet on; others I'm happy to drop subtle hints and leave it just this side of polite. Otherwise, I'm all over every social media site I can think of, hoping that my tiny brass sound can at least be detected by others out there somewhere. I think I'm doing it right; time will tell.